Rochester General Hospital, also known as Northside Hospital, is a hospital on Portland Avenue. It is affiliated with Rochester General Health System. 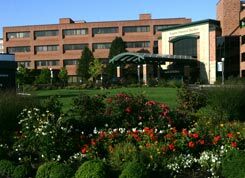 Rochester General Hospital, the flagship of the Rochester General Health System, is a 528-bed acute care, teaching hospital with more than 1,300 medical and dental staff members and more than 7,000 employees serving the Greater Rochester, NY region and beyond. Rochester General Hospital is the fourth largest employer in Rochester and an integral part of the community. Rochester General offers a full array of health care services to meet the medical needs of upstate New York, including nationally recognized programs in cardiac, cancer, orthopaedics, vascular, robotic surgery and diabetes care. High quality clinical care provided at Rochester General is enhanced by relationships and affiliations with nationally renowned institutions such as the Cleveland Clinic (for cardiac care) and Roswell Park Cancer Institute. Rochester General Hospital began as a fairly modest four-story building on West Main Street in 1864 with a mission of serving the community's poorest citizens. The hospital's buildings were replaced in 1909 following a large donation by George Eastman. A branch was opened on Portland Avenue in 1956, and it fully replaced the Main Street facility a decade later. See TWIG for the history of the community support group that has been so supportive of the hospital since 1887, including the TWIG Birthing Center.